Well, for one, it looks seriously scary. They said it best on their campaign overview, “Great horror rests on a bed of foreboding; tension reaches out of the darkness through unseen suggestion, stretching and building up to breaking point.” That might be a tad melodramatic, but you get the point. 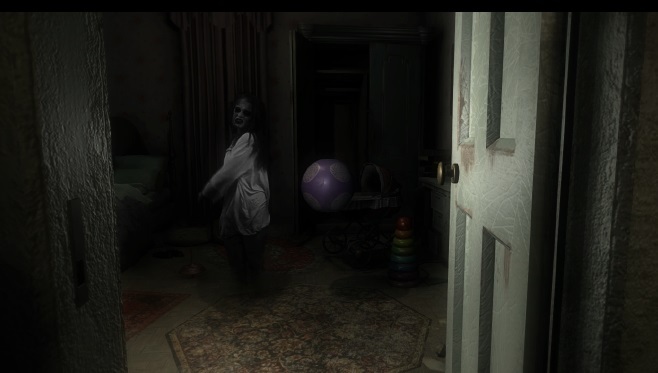 Horror games need to look, sound and feel the part—there’s just no two ways about it. Oh, they also ominously added, “What you can’t see is terrifying; what you do see…is shocking or disturbing.” In fact, if your palms get sweaty and things start to get too real and scary for you, you can even close your eyes in game. Psssh… why look away in real life when you can do it in-game? But not only are the environments really damn freaky; their ghosts look the part as well. They’ve been experimenting with actual actors captured with a stereoscopic 3D camera and green screen. It’s chilling. I’ve covered tons of games with amazing graphics that just seem to fall flat in other areas but this doesn’t seem to be one of them. One thing that jumped out at me was their inclusion of multiple slick, high-tech gadgets. Among those listed: a UV lamp (see what you can’t see with the naked eye), an Electronic Voice Phenomenon Recorder (captures the voices of ghosts), and a Full Spectrum Camera (uh… snap a selfie with a mangled corpse?). Another thing I find intriguing is the “Clairvoyance” feature. It’s a “special para-ability” that allows you to “experience flashbacks associated with an object’s history, which may feed you important information about a ghost’s past or reveal further clues connected to your investigation.” The description is a little vague, but I can’t wait to see how they incorporate all the equipment and the abilities into the game. Maybe some additional gameplay footage or a quick demo will help shed some additional light on these interesting gameplay features. It’s looking likely that Ghost Theory will reach its goal, and when it does, developer Dreadlocks expects to release it a wealth of platforms, Windows, Mac, Linux, Ps4, Xbox One and of course—wait for it—VR. And it doesn’t get much scarier than hunting ghosts in Virtual Reality. Ghost Theory’s campaign ends on May 13th, and you can track its progress on our Campaign Calendar—if you’re brave enough!